I wasn’t aware until I came across Oh! Organics that vegans can’t use most lip balms because they contain beeswax, and vegans can’t use anything made by living creatures. So founder Michele set about finding an alternative ingredient and now uses Candelilla wax which comes from the Euphorbia bush. Mandarin and very subtle. I can also taste the wax but that’s okay! Dryer than I thought, not sticky and slimy and I have to run my finger over my lips to check there is a coating. Again that is a plus point as I often don’t like the stickiness of some balms. This feels very natural. More waxy than mandarin and I can smell the aloe butter. Mixture of candelilla wax, aloe butter, sweet almond oil, mandarin essential oils, but also limonene and citronella. Vegan ingredients so no harm to bees! Similar to other products and comes off quickly because I lick my lips alot. I also have regular drinks which affects how long it stays. It subtly lubricates and takes away dryness so not sure if good for very dry lips, but I like its dryness. Received in nice little bag with note but did not get on with lip balm packaging. The glue on the paper is so tough I could not unscrew the lid for a while and had to use scissors to make a better break in the perforated bit. Matt paper dirties quickly as it is white and basic paper envelope but I am not into big and fancy packaging so it just needs to be easier to initially take lid off. People with arthritic hands etc would struggle. I would buy purely based on organic, vegan and simple packaging. Young environmentally conscious women who value paying for vegan products who want to maintain lip health (normal lips) over taste and feel of a more creamy texture and smell. Buy Oh! 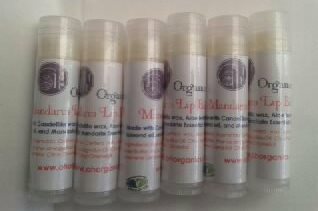 Organics Vegan Mandarin Lip Balm.